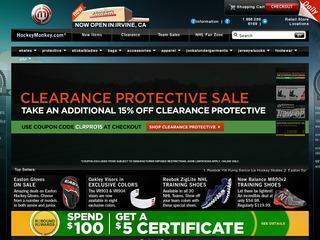 HockeyMonkey is a one-stop resource for Hockey Gear at the best prices. Since 1999, they’ve offered top ice and roller hockey equipment: top brand hockey skates, protective gear, sticks, bags and more for everyone from the beginner to the professional. HockeyMonkey carries the largest selection with the largest inventory of any hockey online retailer. Attentive staff is on hand to answer customer questions and HockeyMonkey products are backed by a satisfaction guarantee.